Montezuma II (or Moctezuma) was trained as a priest and rose to become leader of the Aztecs in 1502. At the time the Aztecs controlled most of what is now Mexico and Central America, their capital being at the great city of Tenotchitlan (Mexico City). The story goes that when Cortes arrived in 1519, Montezuma thought the Spanish conquerors were descendants of the god Quetzalcoatl. Montezuma allowed the Spaniards to enter Tenotchitlan unopposed, and he was captured and held hostage by Cortes. 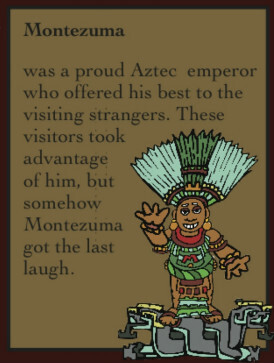 Montezuma was either killed by a rock in the head from a crowd of his own people, or he was stabbed by the Spaniards, depending on who tells the story.